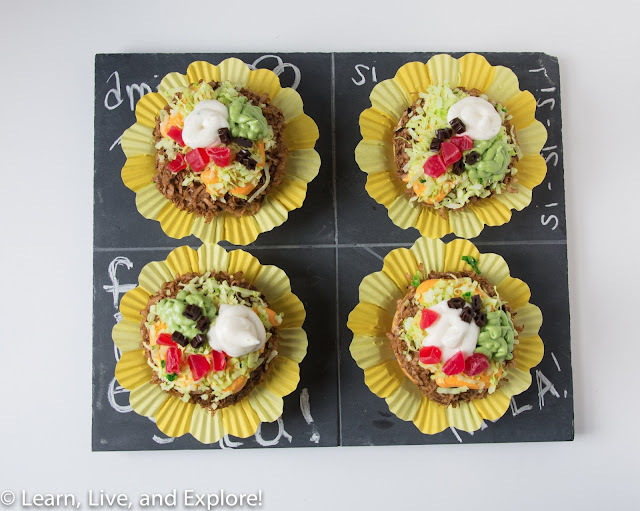 May Cupcake of the Month - Taco Salads ~ Learn, Live, and Explore! Using the lemon tequila cupcakes and lime buttercream I made for the margarita cupcakes I made yesterday, I decided that this months's cupcake design will also be Cinco de Mayo themed. And what do I love to order the most when I go out to a Mexican restaurant, besides margaritas of course...taco salad! 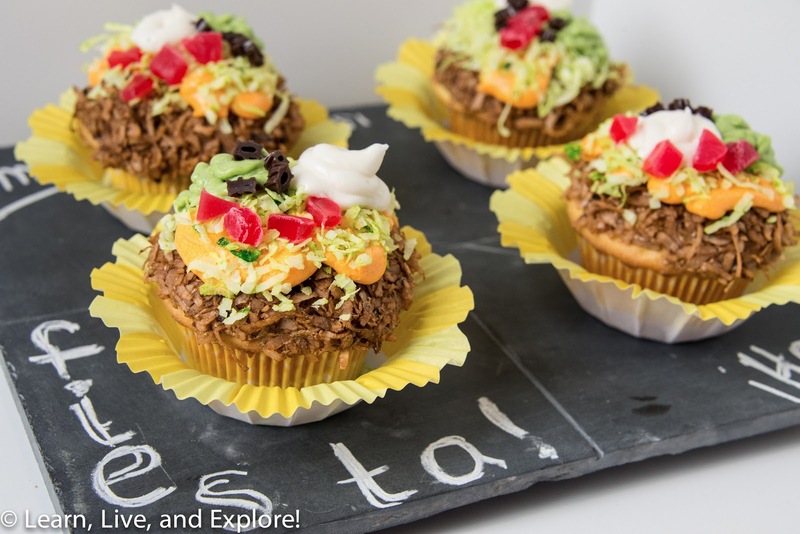 There's something about edible serveware that is just so appealing. (1) Bowl: I had thought about getting waffle bowls and trying to bake the cupcakes in them, but I had read a lot about the difficulties in preventing the edges from burning. I saw some Yellow Blossom baking cups from Wilton at Michael's that I thought would work well, just drop the baked cupcake into them and use as a decorative bowl that will catch all of the "toppings." (2) Meat and Beans: I dyed the lime buttercream and some shredded coconut with Wilton Brown icing color - shaking the coconut with the color in a ziploc bag and drying it on a baking sheet covered in wax paper. I spread a light coat of buttercream on the cupcake, then rolled it in the brown coconut to make a ground beef-like appearance. (3) Nacho Cheese: Again, I dyed the buttercream using a 1:2 ratio of Americolor Orange (113) and Lemon Yellow (107) color gels. A little orange goes a long way, but I needed it to create that nasty looking nacho cheese color. (4) Lettuce: Using the Americolor Electric Green (162) gel color, I repeated the steps for the meat, putting shredded coconut in a ziploc bag with a few drops of the color and shaking it until the color was relatively even. In hindsight, I could have gone with one drop of color and been happy with a nice iceberg lettuce green. I used the "cheese" as my glue for the lettuce. (5) Guacamole and Sour Cream: Buttercream dyed with Americolor Avocado (129) and Electric Green (162) for the guac and no dying at all for the sour cream. Piped on with a disposable piping bag, no tip. (6) Olives and Tomatoes: This is where I had to get creative in the candy aisle. Also, I recommend removing these items before eating because they totally throw off the flavor combinations. I was going to use black licorice for the olives, then I saw the brown-black chocolate flavored Twizzlers that seemed a little more realistic. For the tomatoes, I had considered Hot Tamales candies or maraschino cherries, but ended up using cut up Swedish Fish. Again, remove these before eating! And that's the last layer! 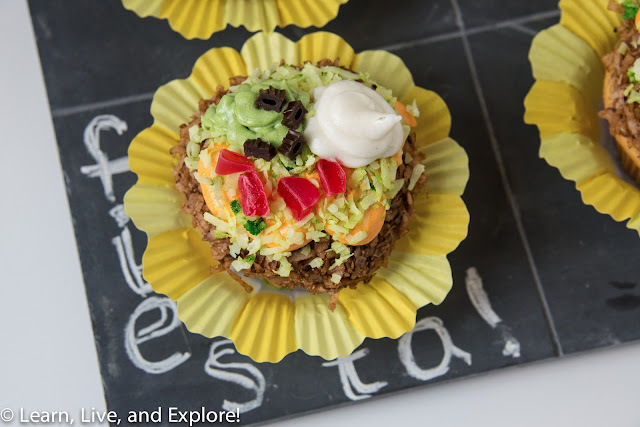 A very cute sweet version of my favorite Mexican menu item! Feliz Cinco de Mayo! And by the way, this is probably one of my favorite cupcakes I've made so far!